Mandi Member Parliament Pratibha Singh called on Union Culture Minister Chandresh Kumari at New Delhi and requested her to fund entire expenditure of the international fairs and festivals organised in the State. Pratibha Singh demanded minimum grant of Rs one crore to each international fair organised by State Government as international Minjar fair Chamba, international Kullu Dussehra, international Lavi fair Rampur, international Shivratri festival Mandi and Summer festival Shimla. She told that all these fairs and festivals are historical festival having rich cultural traditions and Union Culture Ministry should providing full expenditures to the State Government for organising these festivals to promote and preserve the rich cultural traditions of the hills. She also demanded grant of Rs 50 lakh to each State level and district level fairs and festivals so as local artists and folk singers are promoted through these festivals. 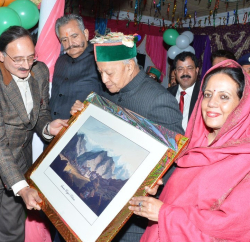 Pratibha Singh demanded the opening of arts colleges in the State to promote and preserve the Pahari Paintings and also requested her to provide venues at national level museums to exhibit and sale of the Pahari paintings so as to make it lucrative and attract new young talent in the painting. 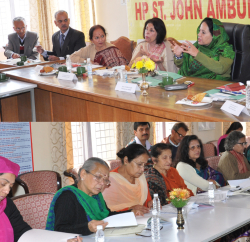 She requested her to include traditional folk songs and dances of the State in the international festivals organised at various parts of the globe and also requested her to include Himachali folk dancers in international troupes sent to represent India in various international events organised from time to time. Pratibha Singh demanded liberal funding from Central Government for renovation of historic temples and other ancient monuments and told that these can be developed as new tourist attractions in the State. She said that all these monuments depicts the rich cultural traditions of the State with various legends associated with them and these can be utilized for major tourist attractions mainly for the school children who come from various parts of the country on education tours in the State. Pratibha Singh requested her to open Central Library at Kullu and also start fellowship in Pahari Dances and folk songs for scientific research on ancient folk songs which will go a long way to promote them at national and international level. 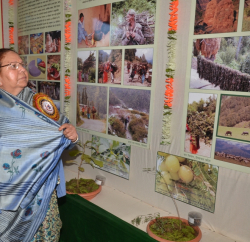 She demanded scientific documentation of all the folklores, folk songs, folk dances and legends to preserve them for future generations and said that many of them may be lost in modern civilization.